Arms & Armor have been making swords for practice and sparring since the late 80’s which makes them a very old player in the HEMA field indeed. 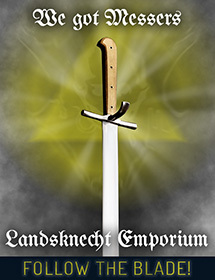 According to themselves, they felt that they originally had a hard time building a market for swords of the federschwert type, since most customers wanted something that looked like a “real” sharp, and it wasn’t until the late 90’s that they felt that there was a growing market for the federschwert. Still, that makes their federschwert one of the oldest and most tested training swords in HEMA, particularly in North America. If you are unfamiliar with this type of swords, then I suggest you read this article before continuing. Currently, Arms & Armor offers four training longswords in their product range; the Fechterspiel sword, the Fechtbuch sword, the Spada da Zhogo and the Montante. The first prototypes were developed at the request of several HEMA instructors and were first delivered in 2000. By mid-2002 they had been through hard testing at various venues. The first model, the Fechtbuch sword, was produced for use in fully armoured combat and half-swording. As the needs for a sword for unarmoured fencing became more important with the growing HEMA community, the lighter, more flexible and less forward-heavy Fechterspiel sword was presented. Since then Arms & Armor have continued to tweak these swords, with input from people like Bill Grandy and others, to suit the evolving needs of the HEMA community and several clubs have asked for custom specifications which Arms & Armor are happy to provide. According to Arms & Armor Fechterspiel translates to “assault of arms”, but it could also be translated as “Fighting Game” (similar to fechtschule), which also describes this type of sword quite well, if we by game think of it as a competition or display of skill. It is designed to be reasonably safe to practice and compete with as long as you wear appropriate protection and control. Together with the Hanwei Federschwert, this is one of the modern ”feder” replicas that the most closely resembles a historical original at the time of writing, although the Ensifer Joachim Meyer Feder and the brand-new Pavel Moc Fechtschwert certainly look good also. Impressively, the Arms & Armor actually travelled to several museums around the world to be able to see the extant examples of federschwert in person. The Fechterspiel sword is based on the feders currently held at the New York Metropolitan Museum, but it also bears some resemblance to the feder in the Military Museum in Istanbul, Turkey. The blade is a simple, flat but tapering blade without any ridge or fuller, as appears to have been more common in the 16th rather than the 15th century, where we also appear to see ridged blades on training swords. The blade is a bit thinner in taper and profile than their Fechtbuch sword “to allow for a quicker action and more flex in the blade”. For the Americans and the Canadians, the Arms & Armor feder is slightly cheaper than the Albion Maestro Line Sparring swords, which will make it an attractive alternative for them, but for those living outside of the North-American continent, with added customs’ fees etc. that does not apply and even for those living in North-America, the price difference is really quite small. The choice more depends on your personal preferences regarding the two swords’ characteristics. More interestingly; if you choose the standard version, the sword can be disassembled completely, since the pommel is secured with a hex nut rather than peened. For a small additional fee the sword can be delivered with a custom made wrench that makes all this easy. This might also be something to consider when travelling by air to various events, since a disassembled sword might pass customs easier. Also, for some, this will lower the shipping costs. However if you, like me, prefer to have your pommel peened, you can have it so just by asking. The grip is made out of ash and covered in leather and has a slightly flared waist and it is thicker than that of the Albion Meyer which could be considered both positive and negative depending on what your personal preferences are. My own preferences have switched from preferring thick grips to narrower and consequently I am not quite as comfortable with it yet. On the other hand, I have heard a lot of people complain about the narrow grip of the Albion Meyer, so perhaps this is what you are looking for. The cross and the pommel are very nice, being finished in brushed steel and the cross especially is beautifully shaped with an octagonal cross-section and neat flaring towards the ends. They are made out of cast tool steel and are quite durable. The flared schilt is narrower and longer than what we commonly see in modern Federschwert, and with a considerably smaller degree of flaring, but quite true to the historical example on which this sword is based, as can be seen in the image above. It is especially good to see that the “corners” of the flaring are quite safe, given how painful and even dangerous the distinctly pointy schilt of the Albion Meyer can be. One of the major advantages of these swords is the fact that they are hand-made and can be made according to your specifications. This is actually a very important factor when comparing to stock produced swords like the Albion Meyer and the Hanwei line, since you can have it adapted to your own preferences and physical requirements. The handling characteristics in my opinion is the closest to the Albion Meyer, when comparing to all other available federschwert type swords. It’s weight, blade & hilt lengths and balance is quite similar, with the Arms & Armor sword being about an inch/2cm longer and about 50gr heavier in total. The blade is slightly more rigid, but the flex is still good, making the thrusting reasonably safe, provided that you have a thrusting point on the tip or proper protection. Although not quite as agile as the Hanwei feder, it is still a very, very quick blade that is easy to control and that is rigid enough to not cause any disturbing wobbling in striking or binding. It has tiny bit of more punch than the Albion Meyer, but again, it is almost indistinguishable to the handling of the Meyer. Using it feels quite fluid and natural and there is no feeling of struggling against it in any way. These swords are extremely durable, at least on par with Albion Swords. 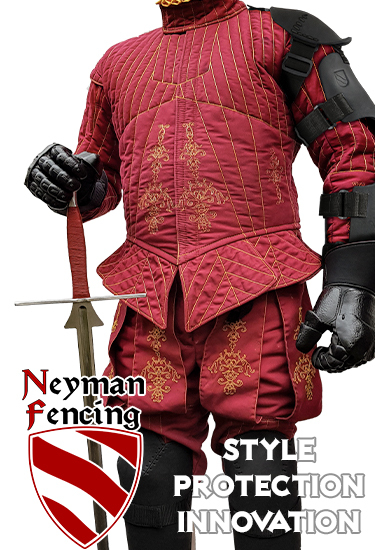 Many fencers have been using them regularly for 7-8 years. Some even for 10 years, even if parts sometimes need to be refurbished. But, given that the swords can be disassembled, changing parts is very easy. Simply put, this is a great sword that has been tweaked in its characteristics for more than a decade. It is well on par with the Albion Meyer both in handling, quality, durability and price, which makes it an excellent alternative if you are looking for something outside of Albion. Some people even prefer this sword over the Meyer. The thicker grip, the safe flared schilt, the possibility to disassemble the weapon for easier transport, the more historically correct design and the raw but beautiful execution of the design are all things that speak for this sword. The only disadvantage I can possibly see is the somewhat high price range compared to some Czech and Hungarian swords, but since these are hand-made in the States and since it is quite unfair to compare to countries with different economics, salaries and general business conditions, I feel a sincere respect for the swordsmith deserving their proper pay for their work. I wouldn’t expect anything else and it is a very fair price. I’ve had one of these for several years now and love it. I bought the Fechtbuch sword when it first came out and was happy with it. Then the Fechterspiel came out and it was even better! I agree with everything in Roger’s review. Very nicely said!